"You can make and serve this gorgeous Italian frozen iced dessert anytime, but it's really best enjoyed during the summer months. Not only is it cold and delicious, but it forces you to stick your hot, sweaty face in the freezer four or five times to stir. 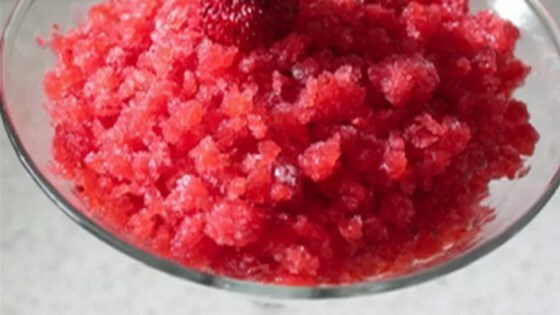 The technique of using a fork several times to mix the freezing granita results in perfect icy crystals." Rinse strawberries with cold water; let drain. Transfer berries to a blender and add sugar, water, lemon juice, balsamic vinegar, and salt. Pulse several times to get the mixture moving, then blend until smooth, about 1 minute. Pour into a large baking dish. Puree should only be about 3/8 inch deep in the dish. Place dish uncovered in the freezer until mixture barely begins to freeze around the edges, about 45 minutes. Mixture will still be slushy in the center. Lightly stir the crystals from the edge of the granita mixture into the center, using a fork, and mix thoroughly. Close freezer and chill until granita is nearly frozen, 30 to 40 more minutes. Mix lightly with a fork as before, scraping the crystals loose. Repeat freezing and stirring with the fork 3 to 4 times until the granita is light, crystals are separate, and granita looks dry and fluffy. Portion granita into small serving bowls to serve. This will work with other fruit and berry purees. Hull strawberries by using the tip of small, sharp paring knife inserted at a 45-degree angle near the hull. Rotate the berry to cut out a small cone containing the hull. It saves a little bit of fruit from each strawberry. Freezing times will vary greatly depending on how cold, empty, large, etc., your freezer is. Just keep checking and forking! Really good! Extremely easy, but very refreshing to have on a hot summer day! This was a WOW and a new favorite in my house. Love this. Made no changes to the recipe and was very pleased with the results. no, no changes. wonderful as it was in the recipe.